Its been more that 3 months I’ve been here in a new country, far from home, family and friends the first thing I do as soon as I wake up is get hooked on to Facebook and read some news about my country Nepal. Back home I was not a very active Facebook user but now its different. Facebook is undoubtedly my medium to get get connected with whats happening back home, other friends round the world and also friend here near by. But the problem is, at times I and we as well don’t get off this web of content put online by our near and dear ones. Some of my friends say I can’t get off Facebook, I’m getting addicted to it. Other people are also kind of addicted to games and other social apps that Facebook has to offer. So how do we limit ourselves using Facebook then? Some one told me to batch the work, do it only once or twice a day like check your email only in the morning and in the evening and the same with Facebook, but I don’t know if that works for me. Recently I read “Facebook users uploaded more than 2.7 million photographs, shared 1 million links and “liked” 7.6 million pages every 20 minutes in 2010, according to the company.” - in an article from Mashable. So we are among the people in that 20 minutes that like the things, post links and photos and do other things on our beloved FB. How do we limit this then? 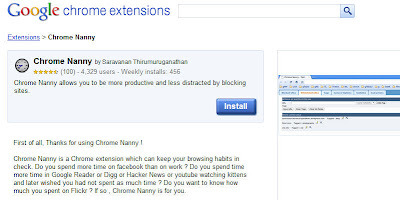 I found a extension for Google Chrome, its called Chrome Nanny. This is a very cool extension, with this extension you can specify the time of day you want to block a website and the days of a week you want to block it. You can also pinpoint the maximum time you want to spend on the website in a day in the hours it is not blocked. This makes it good so that you are reminded that you spent say 30 minutes on Facebook today and its enough for today. You can even see how much time you spent on the blocked website on the time you did not block it so it is a good extension to have. There is a similar extension for Firefox as well called Leech block I think it works in a similar manner. If you try to access Facebook (or other blocked site) in the given time or after you crossed the time limit for the day it shows you a white page with some text no the homepage of the site you are looking for. To users of the non standard compliant browser (Internet Explorer) god save you all from Facebook Addiction. When you add a site to be blocked be very careful about the settings because when you try to edit or delete the blocked site it give a 64 character captcha kind of thing that never matches I don’t know why. You can see the statistics on the time you spent on the websites you want to block in the hours they were not blocked. 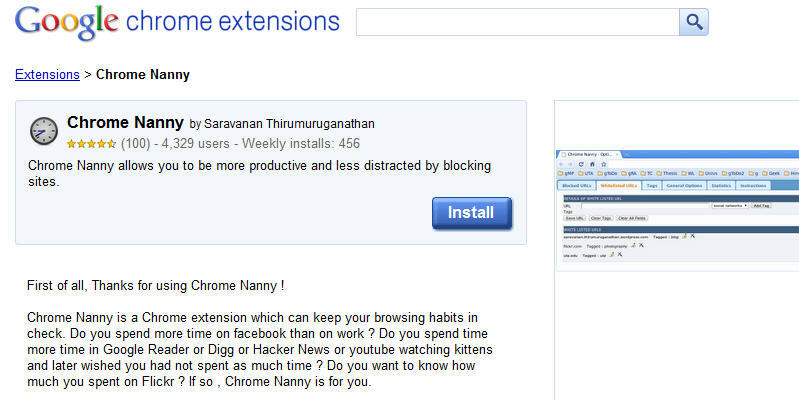 But if you really have to treat yourself with Facebook you can disable Chrome Nanny ;) (not suggested though). 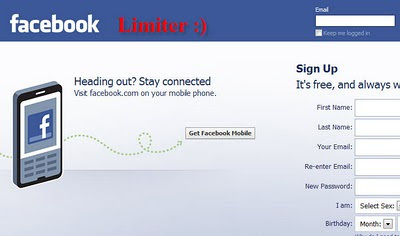 Similarly you can use Minutes Please to get the number of minutes you want to use a website like Facebook. After the specified time the tab/window closes so you cannot use it anymore. May be this is also an option to know how long you want to spend time on Facebook. I am not against Facebook but sometimes you need to be aware that you are spending a lot of time on it. Not only Facebook but you might be spending too much time on other websites like YouTube or some other website that you visit very frequently and loose the track of the time spent on it. So you can add those websites in Chrome Nanny and let the Nanny take care of it for your good. Facebook rocks, its a great way to get connected and it has ample reasons to get the 500 million user it has now. But we don’t have all the time in the world so to manage our time efficiently this might be a hard but practical way to keep things in control. So if I don’t reply your comments on Facebook please blame Chrome Nanny for it. Blogging after so long feels good but time is very less now a days. Happy New Year 2011, hope you use Facebook only as much as you want this year.